This post has been contributed by Don Enright, Communications Volunteer (and Past President) with the Stanley Park Ecology Society (“SPES”). Vancouver is full of beautiful, brightly-coloured birds right now—they’re just a bit hard to spot. As a kid growing up, I was captivated by images of tropical birds, with their impossibly bright feathers. It wasn’t until I got a little older that I realized we have some outrageously bright birds right around us—and while they’re not always easy to spot, they’re right over our heads, singing their hearts out. For me, the absolute winner in the colourful department is the western tanager. The tanagers are, in fact, a tropical bunch of birds—most of this guy’s relatives live in Central and South America. 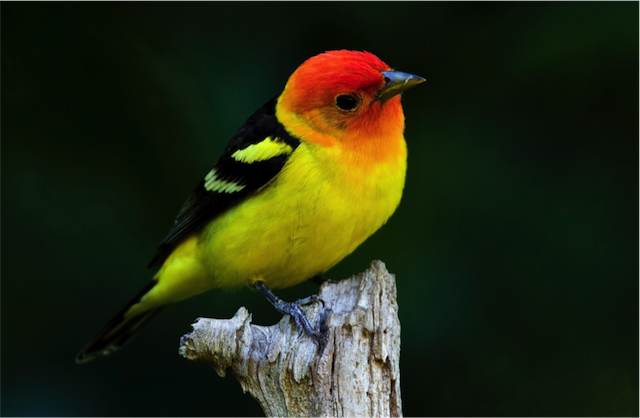 But a few tanager species spend their summers up north, and the western tanager is our local rep. They arrive as if on schedule around the first week of May, and in Stanley Park the broadleaf trees around the Dining Pavilion are a good place to look for them. A word of warning: you’d think that their bright yellow and red plumage would make them stand out against a green tree; it doesn’t. First, you’ll need to listen to their prr-drr-DIK call, and their beautiful robin-like song. Once you tune into their vocalizations, you’ll realize how surprisingly common this bird is in summer (they spend their winters far to the south.) And if you invest a little time staring up in the trees, you’ll eventually be rewarded with the sight of one of these beauties perching in plain view. 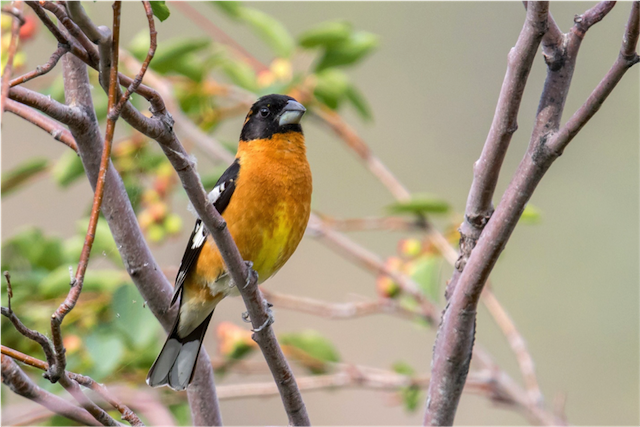 Not far away from those tanagers, there’s another bright and beautiful songbird lurking high in the trees: the black-headed grosbeak. Another summer visitor, this handsome creature sings with the most beautiful rich, resonant tones—from waaaaay up in the trees. Right now, they’re busy tending to their nests. They’re good parents, by human standards—as with most songbirds, both male and female care for and feed the young. And like the western tanager, the black-headed grosbeak is easily heard, once you tune in to their call. I’d be willing to bet you’ve heard one already, but assumed it was a robin. The songs are similar. The third colourful songbird on my list is the red crossbill, and this is one hardy bird. 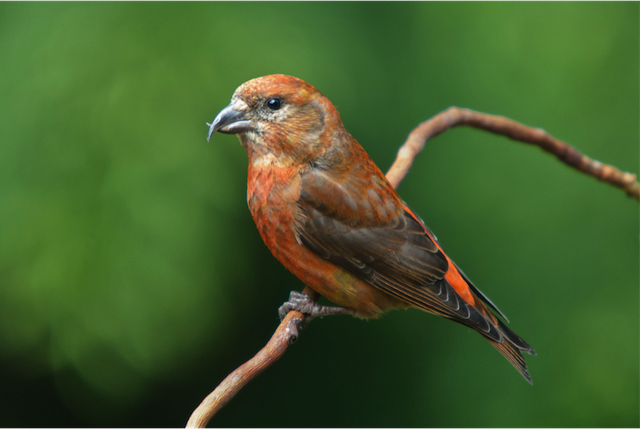 Unlike the other two who fly south early in the fall, the red crossbill is a year-round resident, specializing in the seeds of our conifer trees. In fact, it has a crazy beak that is tailored just to that purpose. Red crossbills are cone specialists. In fact, in years where we’ve got a spectacular cone crop, these birds will set up a nest and raise their young in the dead of winter. And while that beak looks like a breeding experiment gone wrong, it’s actually pretty smart: birds have much stronger muscles for closing their mouths than for opening them—so those curved ends to the beak allow them to pry a cone open with a closing action. While they’re a bit hard to spot way up in the cedar trees, I have seen them down along the rocks near Second Beach during winter. They were probably gathering grit to store in their gizzards—most birds can’t really chew their food, so they pass their seed meals through a stone grinder attached to their stomachs. All three of these birds can be attracted to bird baths during dry weather. If you choose to keep a bird bath, please make sure to keep it clean and fresh. And ultimately, the best way to do these birds a favour is to ensure they have lots of room to breed and to feed. Keeping a little bit of your property wild is a great gesture for our urban wildlife, and ensuring a healthy future for places like Stanley Park will help us keep exotic, colourful songbirds around us in the years to come. As a member of the Stanley Park Ecology Society (“SPES”), I wanted to offer the organization an opportunity to share their news, events, and work so I created the “SPES Series” years ago. This is where SPES can contribute and share stories with my audience once a month. Follow SPES on Facebook for more information.